Imagine a circus-style show under a traditional Big Top that combines trapeze acts, dancing, juggling, music and much more – all with a European flair. That’s the buzz with OVO – Cirque du Soleil, an entertaining family-friendly show with a bug’s life theme at the Santa Monica Pier. The location is pristine – the huge blue and yellow tent is set up just steps from the beach for two months. The international flags blowing along the tent represent the 14 countries of the 55 performers. We went to a 1 p.m. matinee and the weather was gorgeous. There’s a festive mood as soon as you step inside the roomy Grand Chapiteau (Big Top). Like any circus, there’s a smorgasbord of popcorn, hot dogs, candy and souvenirs for sale. There’s even a bar. And although the show takes place inside a big tent, the seats are comfortably padded. Our seats were at the top center, which made it easy to view stage and aerial acts. OVO, which means “egg” in Portuguese, basically follows the story of a quirky insect who falls in love with a happy ladybug. Performers, wearing elaborate, colorful, costumes, portray dragonflies, ants, butterflies, spiders and crickets who eat, crawl, flutter, play and fight in gravity-defying acts. The show begins when a mysterious egg appears, surprising the bugs who don’t know what to make of it. From there, sets change seamlessly to feature each act. Interspersed between the acrobatic numbers are silly clowns who often interact with the audience. Among our favorite acts are a sextet of red ants that juggle jumbo slices of kiwi with their feet; they then take turns juggling each other in perfectly timed synchronicity. They are soon followed by a pair of butterflies who engage in a perilous aerial duet, relying on a rope-like contraption. There’s also a breathtaking flying trapeze act in which six acrobats soar 40 feet in the air. In another act, a performer executes a number of high-wire stunts, including one that requires riding upside-down on a unicycle. The show’s most exciting number is saved for the finale. Nearly 20 performers clad in green and red bodysuits use trampolines to jump, run and leap up a 24-foot vertical wall. 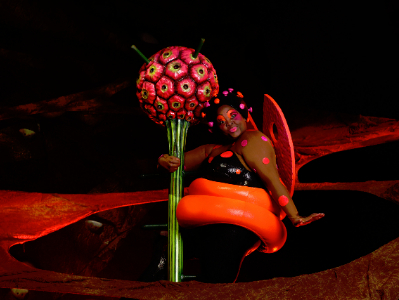 “OVO,” written and staged by Brazilian choreographer Deborah Colker, debuted in 2009 in Montreal and has been touring North America. The music, composed by Berna Ceppas, is performed live. Ticket prices start at $45 for adults, and $31.50 for kids ages 2 – 12. The Family 4 Pack is $194. For more information and to buy tickets, visit www.cirquedusoleil.com/ovo. For family travel stories, follow Los Angeles Traveling Mom on Twitter: @mimitravelz.